As the letter goes on, it becomes clear that she is talking about the filming of “The Happiest Days of Your Life”. 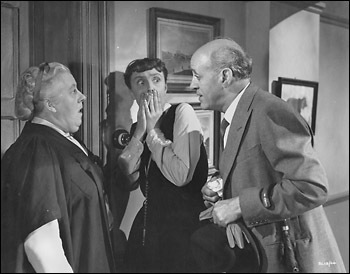 The notes, written by Janie Hampton, state that “Happiest Days…” was the first of the five St Trinian’s films directed by Frank Launder. This is all very confusing. If you were to include this film then the total would be six. But I would not include “Happiest Days” in the St Trinian’s list. Neither of the schools that this film is about is called St Trinian’s. The children are not the stars and they are far too well behaved. It is the headteachers and the teachers that the farce revolves around. The mystery is why did Joyce refer to it as one? Is this down to the editor of her letters getting confused and making a slip? Or did Joyce really write this and did Launder and Gilliat see “Happiest Days…” as their St Trinian’s launchpad? At any rate, although I would never include it as part of the series, it’s a fantastic film and essential background viewing to see an embryonic “Chloe Crawley” making herself at home in a gymslip. Join me for more film fun, download a book for 99p!